After a 3 month period of international review, the COBie Guide has just been published on the buildingSMART alliance website. The COBie Guide can be considered the “commentary” to the COBie information standard “code”. The Guide provides enforceable quality standards for the delivery of COBie data. To obtain a copy click COBie_Guide_-. The quality standards identified in this Guide will be built into the bimserver.org COBie checking routines to provide anyone using COBie a free quality control tool. The Construction-Operations Building information exchange (COBie) format is the international standard for the exchange of information about managed facility assets. COBie does not add new requirements to contracts; it simply changes the format of existing deliverables from paper documents and proprietary formats, to an open, international standard format. While COBie provides the format for the exchange of required asset information, it does not provide details on what information is to be provided when, and by whom. This Guide provides best-practice guidelines for these requirements. This Guide can be considered the “commentary” that accompanies the COBie format specification. To use this guide, customizations reflecting regional practices, specialized project types, and client’s requirements should be documented in Appendix A. The correct application of the COBie Guide may then be reference directly in appropriate specifications. As of 2012 over twenty commercial software products support COBie. These products cover the entire facility life-cycle from planning, design, construction, commissioning to operations, maintenance, and space management. Software implementers will find the information in Appendix B helpful for low-level mapping of required properties. via http://www.4Clicks.com – Premier cost estimating and efficient project delivery software – JOC – Job Order Contacting, SABER, IDIQ, SATOC, MATOC, MACC, POCA, BOA. Exclusively enhanced 400,0000+ RSMeans detailed line items. Cloud computing and BIM are disruptive technologies that will finally alter the culture and fundamental framework of how the AECOO sector (Architecture, Engineering, Construction, Owner, Operations) does business. To appreciate this potential, however, requires a basic understanding of the following terms: The Internet – The Web – Cloud Computing – BIM. The Internet is the substrate underlying the web and emerged from Darpa-funded (Defense Advanced Research Project Agency) work in the 1970s. The Internet is a global system of interconnected computer networks that use the standard protocols, for example, TCP/IP, to serve billions of users worldwide. It is a network of networks that consists of millions of private, public, academic, business, and government networks, of local to global scope, that are linked by a broad array of electronic, wireless and optical networking technologies. The Internet carries an extensive range of information resources and services, such as the inter-linked hypertext documents of the web (world wide web, www.) and the infrastructure to support email. The Web (world wide web, www.) was invented by Tim Berners-Lee at CERN (Conseil Européen pour la Recherche Nucléaire /European Organization for Nuclear Research) in the early 1990s. The web is a system of interlinked hypertext documents accessed via the Internet. With a browser (Explore, Chrome, Firefox…) one can view web pages that may contain text, images, videos, and other multimedia and between them via hyperlinks. Having worked with both, including deploying on of the first truly web-based FM applications in 1998, I appreciate the scope of these two words. Many, if not most, do not. Now on to Cloud Computing, the delivery of standards-based computing, applications, and storage as a service to a public or private community of recipients. It is the the delivery of a standards-based method of providing service in a wide variety of virtual and physical domains that is a key aspect. Computers now existing in our homes, offices, cars, and pockets, and virtual computers exist in the cloud. Computers have traditionally have worked within data networks as clients; consuming but not provide services. This is changing rapidly, Computers that live in the cloud provide as well as consume services. This differentiation may be of little importance to many/most businesses whose computers are being “virtualized”, the processed of simply moving data/IT centers off-premises. In this case, day to day processes, and fundamental business practices are not being affected. Standards and services, and the unparalleled level of collaboration resulting from integration the Internet, Web, and Cloud Computing are converging to create a wave of change that is now upon us. The cloud is social... on a very personal level. For example, computers performing services for us live in the cloud, alongside computers that work for other people in the same and within other organizations. People doing the same, similar, or related tasks in different locations, languages, currencies, etc. How effectively your computers can work for your depends on how well they provide services accessible to those other computers. This requires data standards, common processes, common lexicon, ….. If computers and people they don’t use common, robust terms/formats/processes, they can’t provide those services, and so they can’t efficiently, accurately, securely, and transparently do their jobs. So, what’s cloud computing? Computers and people working collaboratively and providing enhanced productivity, speed, accuracy, security, and transparency for you. Everything working together and “playing nicely”, with virtually no bandwidth limitation within an ecosystem of standards-based services. worth. Thus, don’t fall for “cloud-washing”, the practice of taking legacy applications and porting them to virtual servers in the cloud. You gain nothing. Do your homework and look for standards-based true cloud computing applications that can “play nice” with everyone and deliver a better, faster, and actually fun way of doing work! Now for BIM. BIM, building information modeling, is the efficient life-cycle management of the built environment. BIM requires standards, common terms/lexicon, collaboration, cloud-computing, robust processes, efficient delivery methods, and so much more. 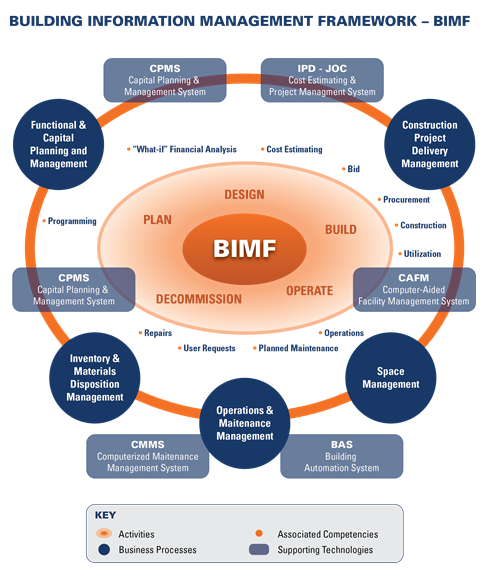 The below graphics highlight components of a BIM framework. Project delivery methods set the tone and largely dictate the relative success of any facility construction, renovation, repair, or sustainability project. Project delivery methods must therefore be a component of BIM, a fact many/most 3D visualization software vendors appear to have ignored. It is the project delivery method that is largely responsible for the fact that productivity within our AEC sector is abysmal compared to any other. Below is are related article that I hope you find of interest. Design/Build, CM, CM@R and, of course,Job Order Contracting. Recently, several organizations collaborated together and published a white paper titled Integrated Project Delivery for Public and Private Owners. 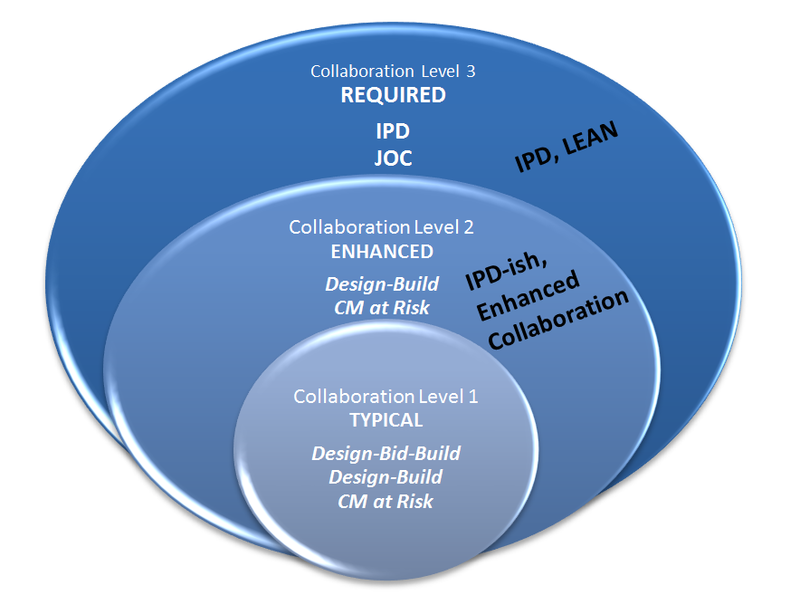 The paper was authored by NASFA, COAA, APPA, the Association of Higher Education Facilities Officers, AGC and AIA, and described the IPD delivery method and explained that it is a collaborative alliance among project stakeholders – owners, designers, contractors and other participants – to optimize the project results. of America Fall Conference last November, I had the opportunity to attend a one-hour breakout session dedicated to IPD. Two case studies were presented on projects executed by the Corps of Engineers. So what is IPD? Numerous papers and articles have recently been published about IPD detailing this delivery method. In summary, IPD advocates pulling together the owner, contractor, designer, and others to achieve higher project results, which in turn increases the overall value to the owner. It promotes collaboration and partnership; it is about integrating design excellence with a constructor’s expertise during the conceptual stage of a project life cycle. Accordingly, the risk profile and allocation change significantly from other traditionaldelivery methods. It is intended for large-size projects. 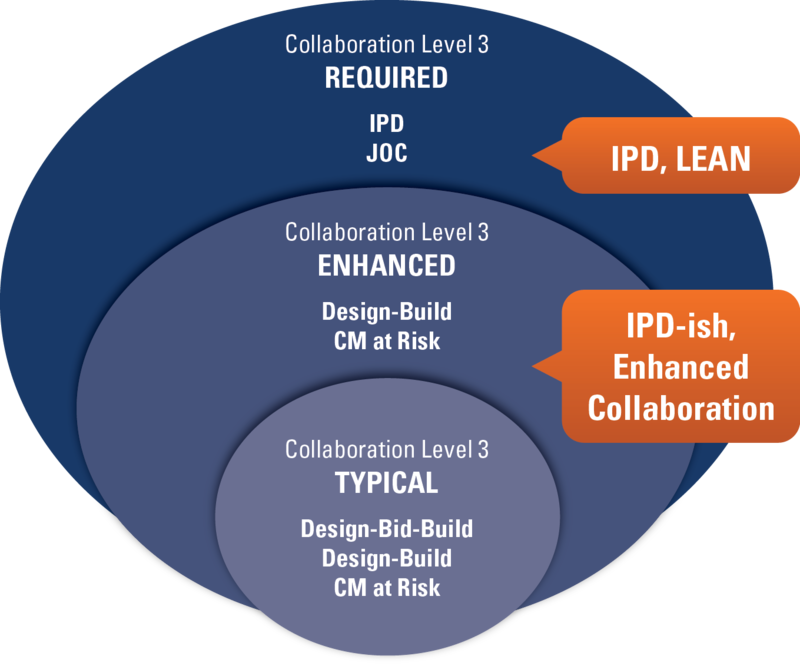 IPD and Job Order contracting (JOC) have several things in common (JOC is actually a form of “IPD-lite”, created for renovation, repair, sustainability, and minor new construction projects). Aside from the typical size of IPD projects, one may find several similarities between the two delivery methods. built on partnering for the long-term relationship to succeed. 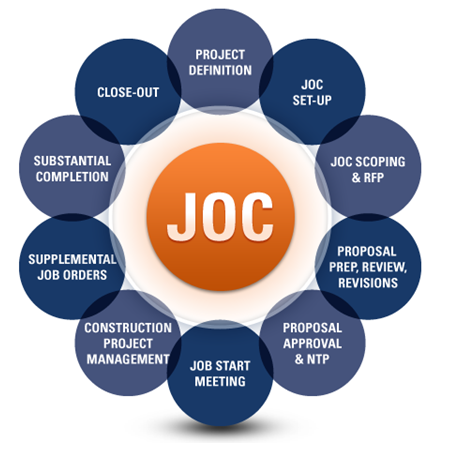 under the JOC program is a typical feature as the starting point for each project (task order) under the contract. Bringing the JOC contractor together with the owner and the designer, when applicable, provides a higher level of common understanding of the scope of work. This helps to eliminate potential disputes and change orders that traditional construction delivery methods are known to experience. about the potential cost, constructability, and value engineering that aids the designer in making more efficient and cost-effective decisions. Common processes are yet another similarity between JOC and IPD. Establishing shared processes that govern the flow of information and communication between all project participants is critical in both delivery methods. delivery methods bring to the owner. As scopes of work are jointly developed, discussed, agreed upon and finalized, a JOC contract is much less likely to have claims, change orders, and disputes than other traditional delivery methods. properly, is a great example of Integrated Project Delivery that has proven to be successful for over 25 years. Manager Texas State University; John Murray, Director of Facilities Management, State of Missouri; Mark Bailey, President & CEO Centennial Contractors. Delivery Method and the specific value it provides for the Federal Stimulus Bill. is service oriented, who is quick to respond to owners requests, can submit sufficiently accurate job order proposals, can meet budget and timelines, and that the contractor become familiar with the owners needs and expectations. Regarding JOC proposals, Allen strongly suggested that reviewers should be experienced and well trained in general contracting and should have walked the job with the contractor so they mutually understand the project scope. He noted that the owner and contractor should be using the same software to develop and compare cost proposals. He also felt that in-house trades personnel can be useful in the review process. Allen concludes that JOC is an effective delivery method when used on the right type of projects with a committed partnering contractor. John agreed with the earlier comments from Allen noting that the partnering philosophy and the importance of having the owner and contractor using the same software program have been strong attributes to the success of the State’s program. The State of Missouri and their contractor both use RS Means JOCWorks software. John’s conclusion was that the State of Missouri is very satisfied with its JOC Program with key elements being a strong working relationship with the Contractor, responsiveness of the Contractor and trust that is developed with success. contractor using the same software program have been strong attributes to the success of the State’s program. The State of Missouri and their contractor both use RS Means JOCWorks software. relationship that is responsive to the owners’ needs. These attributes are created by delivering quality results and showing improved performance over time. To the owner, Mark provided this incite; ensure that JOC is the right fit for your organization, ensure that there is an adequate program volume that will be attractive to a qualified JOC contractor and be sure to consider your JOC bandwidth that generally fits between the inhouse trades that handle T&M contracts and the larger capital projects. The project/task order values in this bandwidth fall between $10,000 and $1M, with a few exceptions ranging to $45M). Mark also noted that the owners should select JOC ‘able’ projects (Allen provided a good list in his presentation) and select the right contractor on a “Best Value” or a qualificationsbased process. Common taxonomy is critical to productivity, transparency, collaboration, and information re-use/management. Within the facility management where process, technology, and productivity lags, common taxonomy must be at the forefront. Various standards are in place and evolving. Here’s a quick view of FM data standards for Europe. This draft European standard gives relevant terms and definitions in the area of Facility Management. It also provides a structure of facility services. This document is a working and standardized tool intended for parties who wish to draw up the Facility Management agreement within the European Common Market. It offers headings, which are not exhaustive. Parties may or may not include, exclude, modify and adapt these headings to their own contracts. 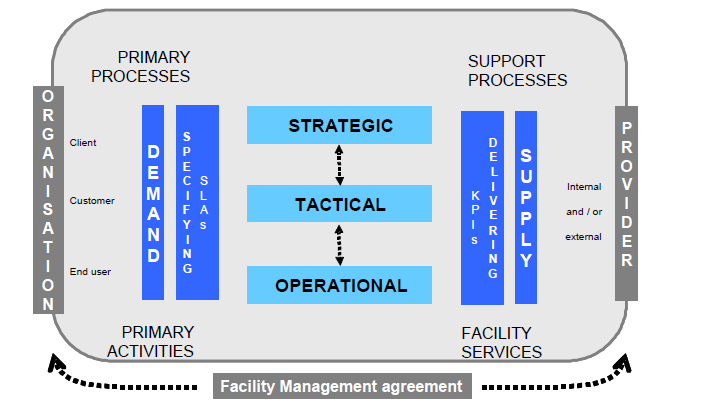 Definition of Facility Management – an integrated process to support and improve the effectiveness of the primary activities of an organization by the management and delivery of agreed support services for the appropriate environment that is needed to achieve its changing objectives. Provides guidance how to measure, achieve and improve quality in FM. It gives complementary guidelines to ISO 9000, ISO 9001 and EN 15221-2 within the framework of EN 15221-1. — functional (e.g. maximum speed of an aircraft). Category or rank given to different quality requirements for products, processes or systems having the same functional use. 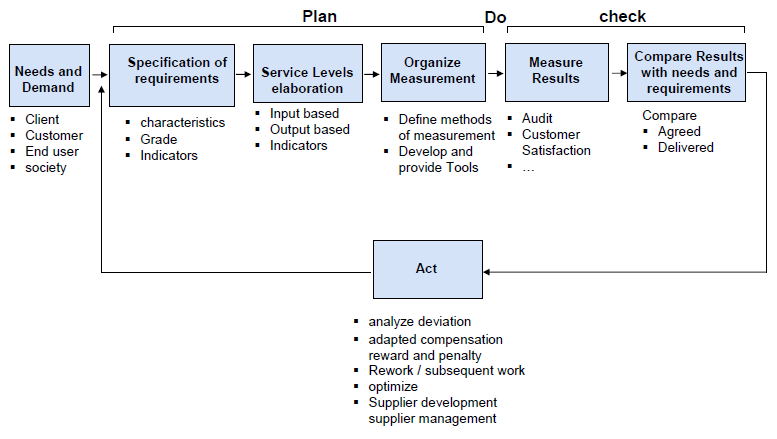 Complete description of requirements of a product, process or system with their characteristics. 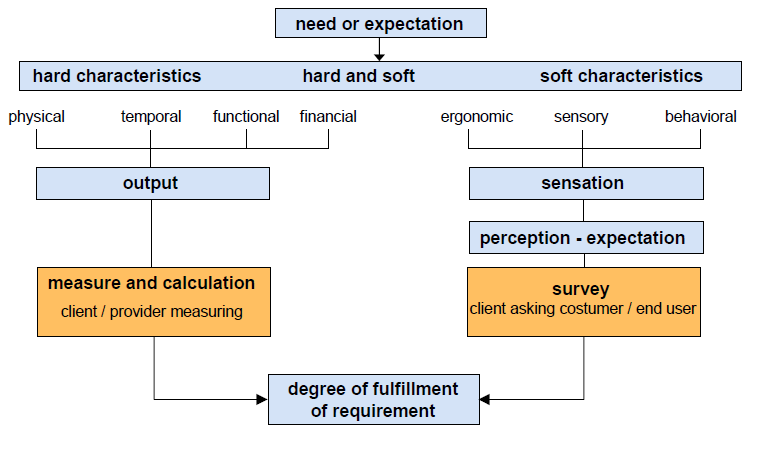 The described set of characteristics in the SL can be graded within boundaries suitable for measurement and analysis. Ceasured or calculated characteristic (or a set of characteristics) of a product according to a given formula, which assess the status or level of performance at defined time. Indicator that provides essential information about performance of the client´s organization. The key performance indicators have to be given by the client´s organization, based on its strategic goals pursuing the development of the primary activities. Indicator that measures the quality of fm products. They are used on different levels (e.g. strategic, tactical or operational Level). 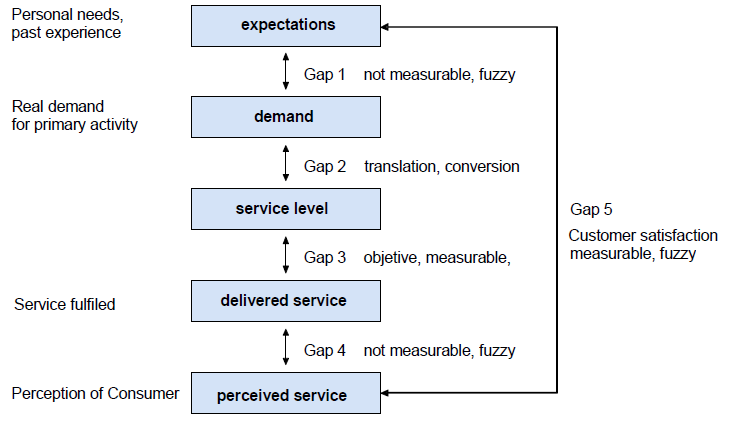 Indicator directly impacting the primary activities and the objectives of the client´s organisation. Fm-indicator linked to client’s organisation objectives and related product which directly impacts the primary activities. Provides guidance to FM organizations on the development and improvement of their processes to support the primary activities. 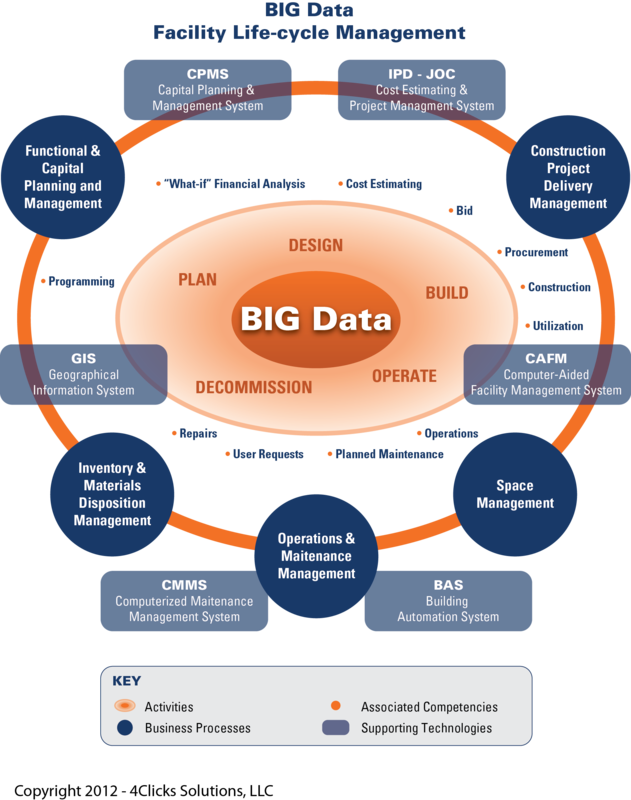 via http://www.4Click,s.com – premier software for cost estimating and efficient project delivery methods and management – JOC, SABER, IDIQ, IPD, SATOC, MATOC, MACC, POCA, BOA …. Masterformat, Uniformat, and reference cost databases such as RS Means Construction Cost Data are important “best practices” for enabling facility Owners, Contractors, AE’s, and oversight groups to achieve higher productivity, accuracy, and transparency for all construction, renovation, repair, and sustainability projects. – MasterFormat is a standard for construction unit price line items for commercial and institutional ( JOC, SAB ER, IDIQ, SATOC, MATOC, MACC, POCA, BOA) building projects. MasterFormat was developed by the Construction Specifications Institute (CSI) and Construction Specifications Canada. In November 2004 MasterFormat expanded from 16 Divisions to 50 Division to keep pace with the construction industry. .
– UniFormat, also a publication of CSI and CSC, is a method of arranging construction information based on functional elements, or parts of a facility characterized by their functions, These elements are often referred to as systems or assemblies. Uniformat II is the current version available. – RSMeans Cost Data adheres to, and expands upon the MasteFormat and Uniformat II standard, while 4Clicks provides an even further enhancement of RSMeans Cost Data, providing approximately 400,000 line items. DOE has determined that the quantitative analysis of the energy consumption of buildings built to Standard 90.1–2010,as compared with buildings built to Standard 90.1–2007, indicates national source energy savings of approximately 18.2 percent of commercial building energy consumption. Additionally, DOE has determined site energy savings are estimated to be approximately 18.5 percent. States are required to certify that they have reviewed the provisions of their commercial building code regarding energy efficiency, and as necessary, updated their code to meet or exceed Standard 90.1–2010. Certification statements by the States must be provided by October 18, 2013.
training, and support for the new code as long as the new code is based on the national model codes (in this case, ASHRAE Standard 90.1). grant programs administered by the National Energy Technology Laboratory (NETL). DOE does not prescribe how each State adopts and enforces its energy codes. via http://www.4Clicks.com – Premier software for efficient project delivery – JOC, SABER, IPD, SATOC, MATOC, IDIQ, MACC, POCA, BOA – Cost Estimating and Project Management. Building information modeling (BIM) is a disruptive new technology in the construction industry and altering way structures are managed from concept thru deconstruction. The processes in which Owners, Contractors, Architects, Engineers, Engineers, Overight Groups, Users Business Product Manufacturers, manage the built environment will dramatically change. Collaboration, communication, and transparency will drive improved productivity and decision support. Utilization, sustainability, security and life-safety, as well as long term economics will all be improved. 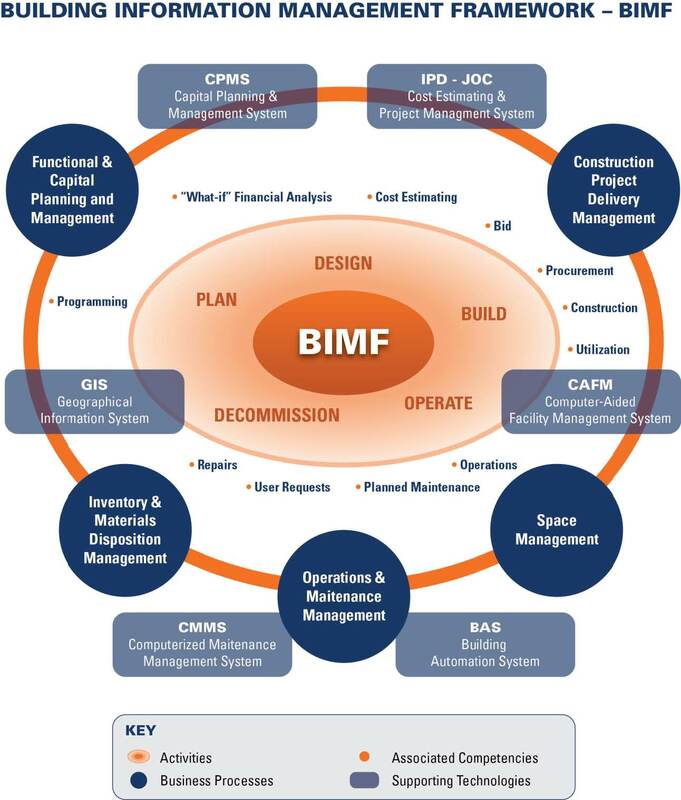 BIM models, communicating with multiple other knowledge domains, such as CPMS, CMMS, CAFM, BAS, GIS, and efficient contruction delivery methods such as JOC – Job Order Contracting, and IPD – Integrated Project Delivery will enable the improved, standardized information usage. 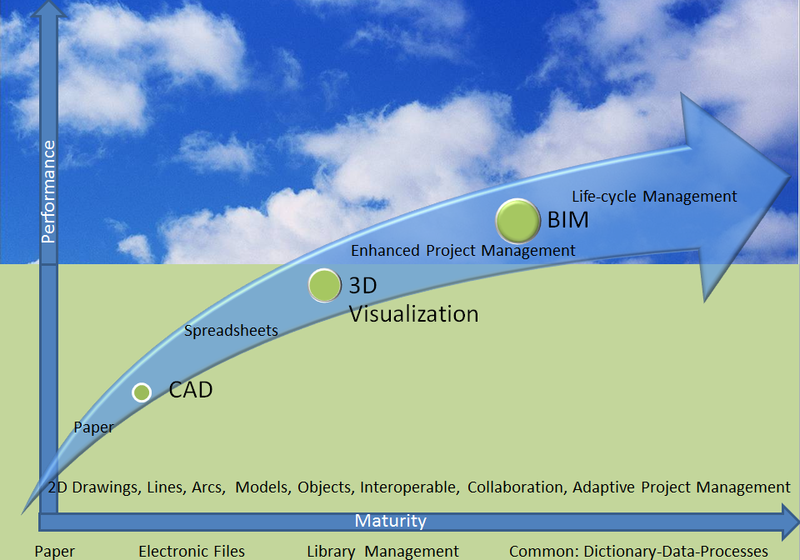 Life-cycle management supported by digital technology and robust, domain specfic, supportive knowledge area is the hallmark of BIM.